A classic film-noir, it was all I needed to get over a nasty cold that bugged me for a week! On a serious note, though, I knew Hitchcock would more or less keep the storyline intact, and I really enjoyed the twists to the story, but what about the ending? Would that be totally different in the book? Du Maurier gets into the protagonist's thoughts, and we are treated in the beginning in following an inexperienced, slightly naive girl as she meets the man of her dreams and marries him. Interestingly enough, she's never mentioned, except for her married name, Mrs. de Winter. Is she not important enough to be named? Is the fact that there is a first Mrs. de Winter (Rebecca), so overpowering that noone else can come to that level again? I would be his wife, we would walk in the garde together, we would stroll down that path in the valley to the shingle beach. I knew how I would stand on the seps after breakfast, looking at the day, throwing crumbs to the birds, and later wander out in a shady hat with long scissors in my hand, and cut flowers for the house. A husband is not so very different from a father after all. There is a certain type of knowledge I prefer you not to have. It's better kept under lock and key. So that's that. 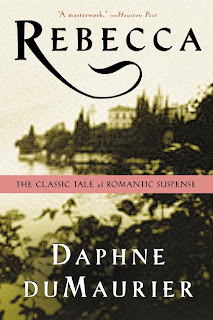 Have you read My Cousin Rachel by du Maurier? I haven't but have recently been hearing really great things about it. I loved Rebecca when I read it and you're absolutely right about Maxim and coming out just fine. I look forward to re-reading this one again someday. I have been discouraged by Rebecca last year, and had to give it up for now. I just don't get Maxim, and I was frustrated with the "heroin". I felt like I was missing something, since this book is praised by so many people, so i'm happy to see i'm not the only one who had to struggle. Maybe one day I'll get back to it and finally finish it, but in the meantime I wonder if I shouldn't just watch the movie - because I'm really intrigued and want to know what happens! ah, we're not the romantic ones ;-) I can fully recommend the film. Provided you like old movies, and Hitchcock ones in particular, it has great ambiance, perfect for a gloomy day! You watched the movie knowing that you were reading the novel?! For shame Patty! Wasn't it a bit disappointing already knowing the ending? hi hi - actually, I prefer knowing the ending. That way I can pay attention to the other details!!! I started this last fall but had to set aside. I didn't get far enough to have much of an opinion on any of the characters, but I loved the prose. So haunting! You're so right - you should persevere and read it again!